If you’re like me and have never heard of the Upper Peninsula, I encourage you to go check it out. You’ll find some of the most beautiful land in the U.S. Having lived in the interior of Alaska for five years I (Lynn) have to say it was very reminiscent. The flora and fauna…and even some of the fresh air smells were identical to what I remember. We stayed five nights at Tahquamenom Falls State Park which offered electric sites for $21 per night. 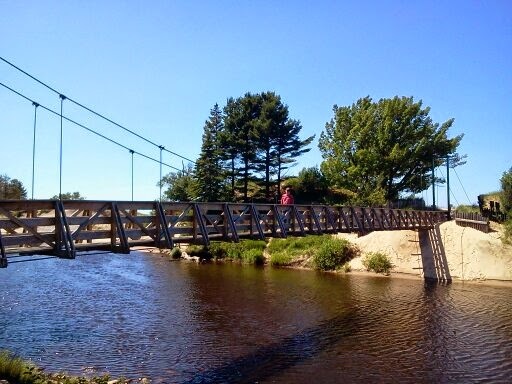 There are numerous hiking trails and an on-site row boat rental for just $5 (for all day). The boat is necessary if you want to explore the little island at Lower Falls but tooling around the falls, and throwing a fishing line in the water, is pretty fun too. Row, row, row your boat…Clark looking for the fishing hole. The falls are beautiful. Upper Falls is the largest east of the Mississippi River, dropping almost 50 feet and with a width of more than 200 feet. 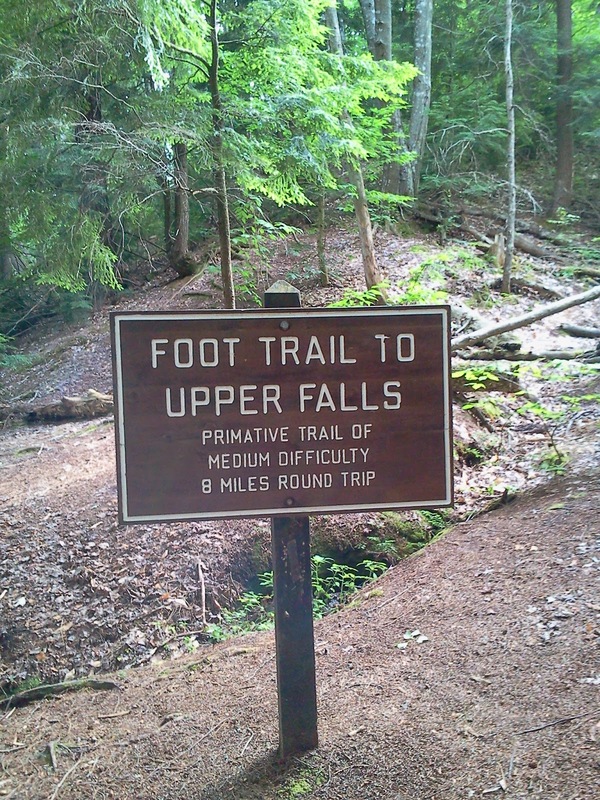 Lower Falls is 4 miles downstream but both are easily accessed from parking lots. 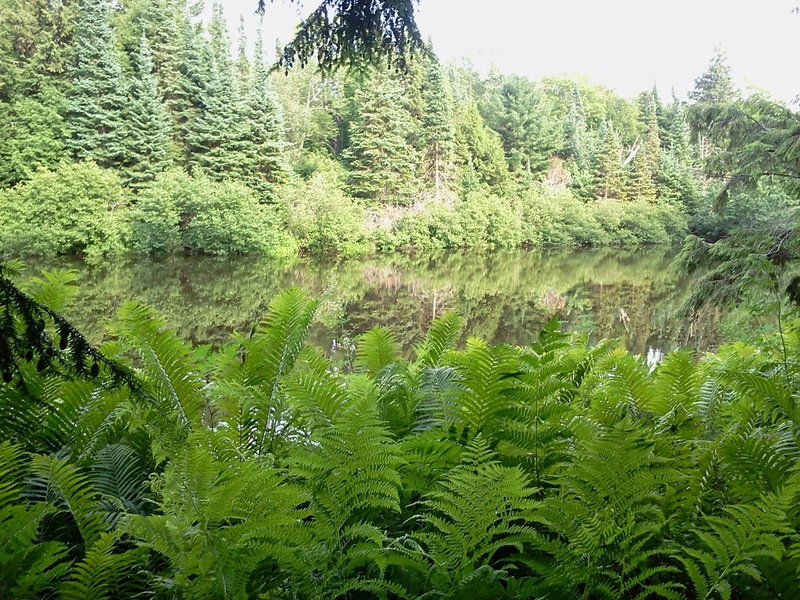 However, the highlight of our stay was hiking the Tahquamenom River Trail. At four miles long, the river trail follows along the bank and offers so many glorious views that you’ll need to allow for an extra 30 minuted to an hour in travel time to take all of the pictures. I only hiked one way and Clark picked me at Upper Falls where we had a cocktail at the Tahquamenon Falls Brewery and Pub (aka Camp 33). Stunning views where the river slows to a crawl. 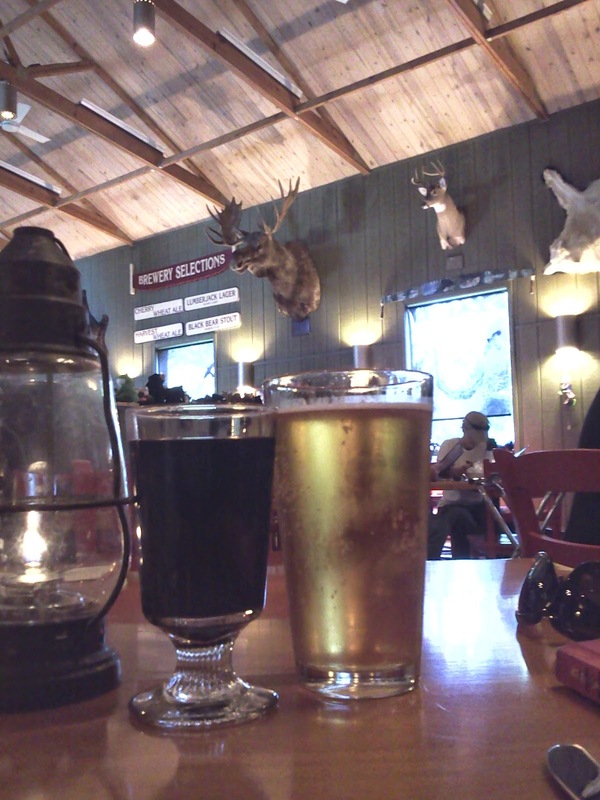 Camp 33 Brewery at Upper Falls. 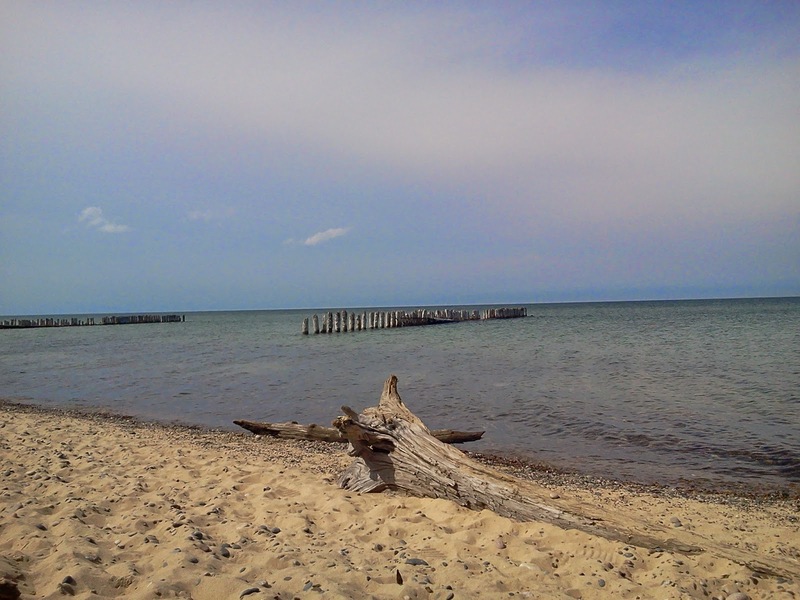 A worthwhile drive is the 22 miles (about 40 minutes on way) to the Great Lakes Shipwreck Museum in Whitefish Point. Although there is a $13 (per adult) entrance fee the museum is very well done and worth the price of admission. Inside, you’ll see artifacts that have been recovered from various wrecks, including the brass bell from the famous Edmund Fitzgerald…which is accompanied by Gorden Lightfoot’s haunting 1976 ballad “The Wreck of the Edmond Fitzgerald” playing in the background. An moving reminder of the power of the Lakes. Tour the lighthouse quarters and visit the lifesaving station to see how some lives were saved from the often treacherous water of the Great Lakes. Bring a picnic to enjoy on the shore of Lake Superior. 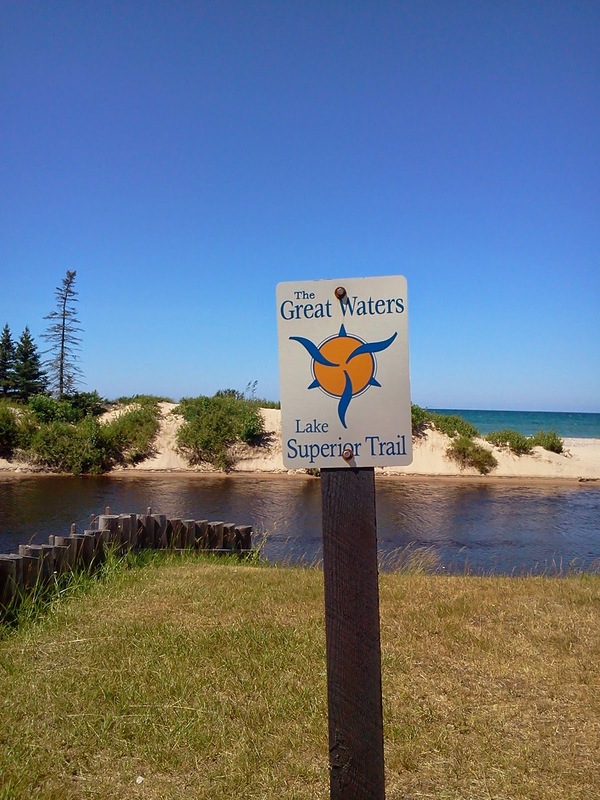 There are many areas to explore in the U.P. Some require 4-wheel drive and most are off of unmarked roads with many branches and twists and turns. Directions to really cool places will likely be guesstimates on mileage and natural landmarks that might not exist since the last time the person giving you said directions has visited. But all are worth the effort (as long as you have a GPS and DON’T get lost). Make sure to talk to the locals for directions. “Big Two-Hearted River” has strong autobiographical elements. During World War I, Hemingway signed on as a member of the Red Cross at age 19, and was sent to the Italian Front at Fossalta as an ambulance driver. On his first day there, he helped to retrieve the remains of female workers killed in a munitions factory explosion, about which he later wrote in Death in the Afternoon: “I remember that after we searched quite thoroughly for the complete dead we collected fragments”. A few days later, on July 8, 1918, he was severely wounded when a mortar bomb exploded between his legs. He was sent to a hospital in Milan where he recuperated for six months; after his return home, he went on a week-long fishing and camping trip in September 1919 with two high school friends to the backcountry near Seney in Michigan’s Upper Peninsula—a trip that became the inspiration for “Big Two-Hearted River”. Two Hearted River, an inspirational point for Earnest Hemmingway. 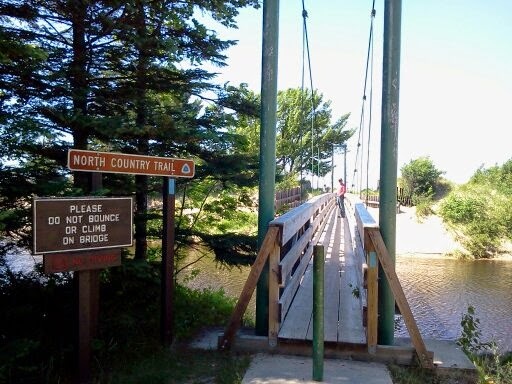 The bridge over Two Hearted River leads to the shore of Lake Superior. 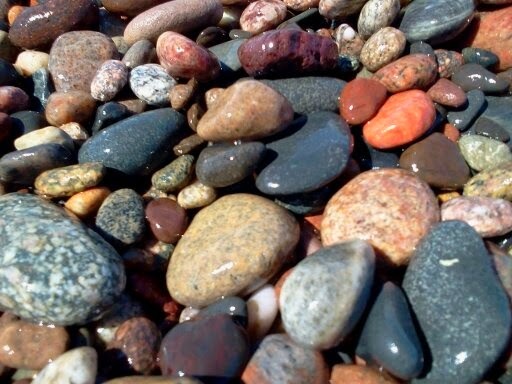 It’s a beautiful spot with amazing agate collecting opportunities (if you know what to look for…I do not). The ‘beach’ near Two Hearted River. 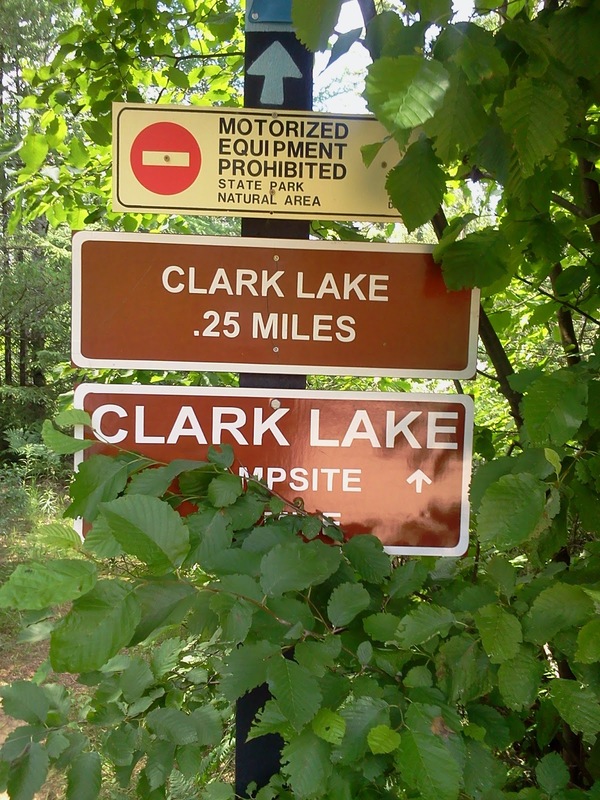 Of COURSE we had to see Clark Lake! 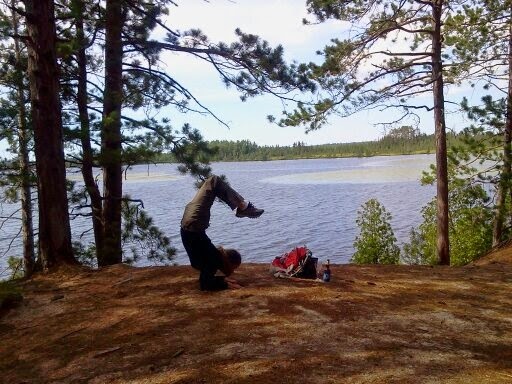 A little scorpion pose at Clark Lake. There’s boondocking here…well, if you have a backpack and tent. Otherwise, bring a picnic and enjoy the views. Gheezis, the great Sun, behold me. 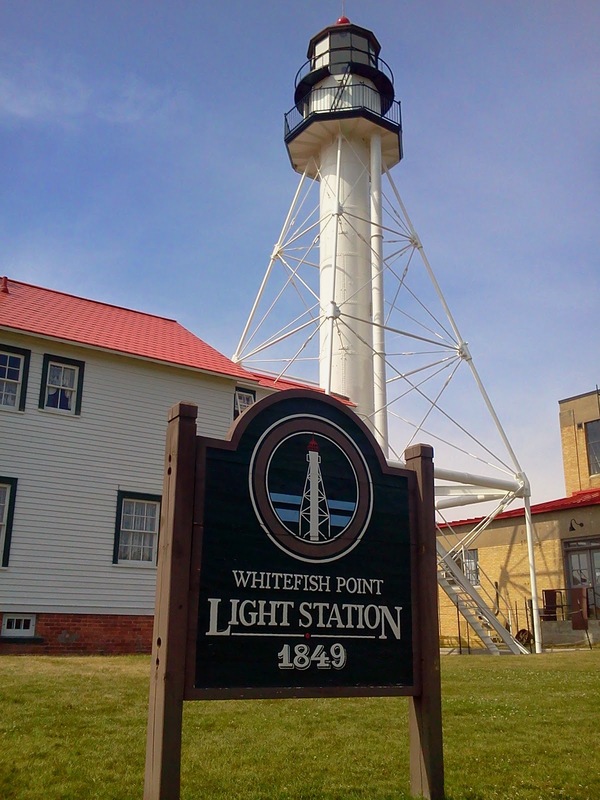 We went to Whitefish Point last year on a trip Mackinac; it was beautiful! We can't wait to go back in the RV. We loved it up there and were just talking about going back maybe next fall (or late summer). We missed out on seeing Pictured Rocks National Seashore and have heard nothing but great things about it. Maybe we'll run into you some time! Oh gosh! The U.P. looks absolutely fantastic and breathtaking. That waterfall is so majestic. I'm sure that now that summer is in full blast, more and more campers would go there. I can't wait to go there myself as well. Anyway, you take wonderful pictures. Stay safe on the road! 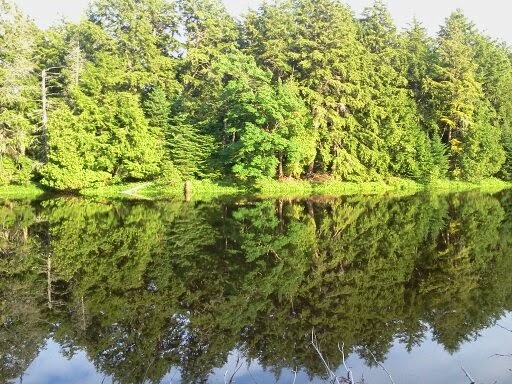 It really is beautiful and very unique…a true wilderness. Thank you so much for reading and commenting, it really does mean a lot.